I'm really concern with the lack of range on the larger model. It seems like it's gonna ended up like B757-300 or B767-400ER. Looking at the range capability, it doesn't seems like Boeing actually make a replacement for the successful B767-300ER. The smaller version would have decent range of 5,000nmi. Which is enough for many medium-haul flights. But the 4,500 nmi range for the larger model doesn't make sense. And I know that they want to save money on development. Wouldn't it make more sense to get at least 1 more engine with higher thrust and increase the range to capture the 6,000 nmi knowing that it would sell really well because many airlines actually want aircraft this size with these range? You're overthinking this a bit. Look at actual missions being flown, not the last bit of capability of the aircraft being replaced. 4500 nm gets you a very large chunk of TATL. Almost all missions between Europe and east/central North America will work. West Coast to major Western Europe hubs such as LHR/CDG/AMS/FRA will work, although without cargo. That range also gets you essentially all Asian regional service, as well as routes between Europe and the Middle East or the northern half of Africa. And of course if the seat-km economics are right this will also be a seriously attractive product for premium US transcons, a huge and growing market. People always want to over-range everything. I don’t get it. Be the right low weight for a given range that has a lot of possible routes. Everyone here wants to play on the 97th percent of the curve. If the NMA starts at 4,500 - that range will just grow over time with PIP's and NEO's - by the end I'm sure it will be close to a 6,000 nm Bird. Start low and grow! It is quite simple, for routes over 5,000 miles use the 787 or the 330. The real flaw was in the area of product definition, significantly when the choice was made to "bake in" a stretch in the baseline model..
Not only that. I believe that Airbus misjudged in the definition stage (i.e. around 2000) how fuel efficient modern large turbofans have become (even before GTF tech). They designed a wing with sufficient capacity (both in terms of lifting capacity, as well as fuel volume capacity) for 8000 nm range with mid 2000's engine tech in mind. Since engines have become so fuel efficient, even a theoretical stretched A389 would not even require that fuel volume, and by logic also not the lifting capacity (fuel is heavy). Even if the A380 program would continue, the wing would never need its full potential. The massively oversized for the job A330 ( nigh short of 280t capability ) beat the right sized 767 to a pulp, didn't it? It should have it was more efficient on gas and a size up in size. It's MTOW is not 280T - it started at 212T (Vs 187T on 763ER) and will grow to 252T also growing significantly in range as Engines have gotten more efficient. It could barely do 4,000NM at introduction(it can now do 6,550nm). Only when it got to about 5,000NM (NMA ranges) did sales take-off. If it had been designed for 6,550NM from the get go (if the engines in the right thrust range had actually been available) - it would have been a lot heavier and could now be pushing 9,000Nm in range. The point is don't over design the NMA for missions that it might go on 1% of it's time - design for what it will be used 95% and it will grow into further capabilities over time. The airframe and wing is scoped for 280t. And with the original 212t A330 that was much more of an oversize than with the current or future offering. still the 763 and 764 were outclassed. Well I'm looking into cities like VIE, FCO, PRG, WAW and the fact that many west coast cities are out of reach for the larger B797. Even FRA, TXL, CPH, AMS, BRU also out of reach to west coast US. Taking weather and payload into account, it doesn't seems logical not to amp up the range capability for the larger models. SYD/MEL to South Asia also out of reach. West coast US and major South American cities like Rio or Sao Paulo, Buenos Aires or Santiago de Chile. Sounds like many potential market is out of reach. We know larger variants of B797 would be good for these routes (in terms of capacity). Well I'm just doing comparison with B767-300ER's capability. Knowing that it's the most successful variant of B767. It's weird that Boeing didn't use this opportunity to replaced it knowing that it's actually sold well. Even the freighters variants doing really great these days. Instead of looking at the "Possible routes" I prefer to look at "Realistic Routes". West Coast US to some Western/Central/Eastern Europe are out of reach with each other. Even major cities like Frankfurt or Amsterdam are out of reach to West Coast US. West Coast US and major cities in South America are also out of reach. Rio, Sao Paulo, Brasilia, Buenos Aires, Santiago de Chile. South Asian cities and Major cities which located mostly on Eastern part of Australia (SYD, MEL) are out of reach with each other. These cities pair are realistic and important market. But with the 4,500 nmi range. Larger variant of B797 unable to cover these market. For those Boeing has the market leading 787. That’s pretty much the difference here. Airbus inserted itself into what turned out to be too big of a gap between the 767 and 777. Boeing bow effectively dominates the space the A330 was in with the 787. A key will be to not leave enough space for something between the 797 and the 787 to thrive. NMA is a key connector between whatever replaces the 737 and the widebody lineup. Ideally you want to leave very small gaps in there and force your competitors to compete on price, manufacturing efficiency and technology rather than market placement. Dunno if this has been discussed yet but I’m guessing that the 797 BBJ prospects would be good? More space than either 737-9 BBJ and A320 ACJ. Every WB new plane or major upgrade has pushed 8000 miles. Which means they still are fairly efficient at 5-6000 miles. And they all did it by being 'heavies' or a fair amount heavier. Airlines don't need another. The 797s niche, big niche, is as a 'light', or at least moderately light. It will push the 737-320 models at their larger or longer legged limits, the 787/330s at their lower limits. The worst Boeing could do if they build it is have to write off much of the R and D costs, and sell it only including manufacturing costs plus profits. Most of us think they will do a lot better than that, the programs is likely to be very successful models. It will hit the 320/330s more than it will Boeing's 737/787s. Widebody BBJs are a pretty niche business. You get a lot of companies that get useful function out of the narrowbody airliner-based business jets for transporting teams or shuttling people between offices. But the widebody ones are pretty much just about rich guys trying to one-up each other with planes that may fly a few hundred hours a year at most. Although the 797 will be cheaper than previous widebody BBJs, I think it'll still be a rich guy's toy. All BBJ's orders at 261, deliveries 237. In the WB there are about 15 for each model, except only 8 767. Most NB's. About 20 each year, most being 737, So like 2% of the market. I just hope that they sneak in some freighter provisions, both for a F model and future P2F. Would look good in Fedex colors. When Boeing published the first specifications for the 7E7, the base model was sized as a direct 767-300ER replacement. Airlines said “bigger” and Boeing revised the configuration to more closely match the A332 and A333 capacity points. I have a three post per topic limit. You're welcome to have the last word. Every WB new plane or major upgrade has pushed 8000 miles. Which means they still are fairly efficient at 5-6000 miles. If you took the same 787-8 size cabin area and then 100% optimised three aircraft designs with a brochure range of 4000nm, 6000nm and 8000nm it would result in massive efficiency differences. On a 4000nm flight the 8000nm model would burn 20-30% more fuel per passenger than the 4000nm model. Even the tail would be smaller and lighter on the 4000nm model as it would have a smaller wing, less thrust and with one engine out it will not need as much side movement. Less tail forces means the fuselage tube can even be lighter. You get stuck in an optimisation loop. This is the exact opposite that was done in the 787-3 as nothing was optimised. Some rough numbers with the 787-8 fuselage area. We'll start off with a 787-8ER numbers and wing area is based on percentage of maximum takeoff weight. The larger 797 model will be much closer to the 787-8 in cabin are than people think. It is worth noting that the 797 engines thrust number we are hearing about are slightly higher than the thrust numbers I mentioned above for the 4000nm range optimised 787-8. An aircraft designer can reduce wing size and simply increase engine thrust to compensate. One reason to do this would be to reduce empty weight as much as possible which will reduce airport fees. Fuel burn will increase but on very short flights airport fees can make up a significant portion of total trip costs. So the 797 could be slightly underwinged which explains the slightly higher than expected thrust numbers. Think 757 sized wing on a 767 fuselage with weights half way between the two. The 797 won't be as underwinged as the A321LR but it won't be overwinged like the 787-8. Well I'm just doing comparison with B767-300ER's capability. Knowing that it's the most successful variant of B767. 767-300ER was the only successful 767 variant because it was able to do something that 757 wasn't able to, which is flying up to 6,000 nm. Other variants were dominated by 757. 767-200ER: more range, but it would be better to go with 767-300ER, CASM isn't too great. 767-300ER: offers more range than 757, and that's why it has sold well. 767-400ER: it was introduced too late (EIS in 2000), couldn't compete with A330, it has only sold 38 frames. I don’t believe that the success of the 767 was tied to 6000nm of range. The 767-300ER can’t fly a typical load 6000nm. There were some routes over 5000nm, but the 767 faces payload restrictions beyond about 5000nm. I believe 5300nm was the longest ever flight in a typical two class configuration. The 767 allowed airlines to fly Transatlantic hub to spoke. Before the 767, airlines we’re flying 747s hub to hub between major cities and forcing connections on both ends (remember US airlines with 727s in Europe) or flying routes less than daily or making multiple stops. In the 1990s the 767 became the most commonly used plane on Transatlantic missions for a period of time. I see the NMA doing the same thing point to point and allowing further hub bypassing. RJAMX - a 767 Fuselage? You mean 7W? Are you coming to the dark side from your 8W narrative? I know you most likely aren't but it's Saturday morning and I felt like writing something. Just kidding. However you could get close to 788 floor area (if you are right on that - unless you have inside information - you should stop making such definitive statements like "The larger 797 model will be much closer to the 787-8 in cabin are than people think.") by stretching an 7W NMA to 764 lengths (61M) or something close to that - a lot easier to do in Carbon with less penalties than Aluminum. BTW Boeing classes 764 and 788 as essentially the same 1-class passenger Capacity at 375/381 respectively. The also have nearly identical Cargo capacity at 764 - 4,905ft^3 and 788 - 4,826ft^3 as well. Interesting details. Thanks. I was perhaps not clear, but the 777, 380, 787, 350, 330neo are all capable in some versions of upwards of 8000(+), but are used for as short as 4000. The 797, properly, is aimed at that 4000, and then plus or minus 1500 give it a niche which may be awesome. But it will never be capable of that 8000 mile range - a virtue, not a fault. And it is the first new Boeing/Airbus* plane in what, 30-40 years which will not have an 8000 mile version. Those numbers look exactly like the non-ER 767-300. It's almost if I am looking at 767-300 specification section in Wiki, and that model sold only 104 frames over its lifetime. I doubt that Boeing would repeat its mistake. Now, if you meant that this model would have a 788 size, then I don't see how they would drop its OEW to 80T. BTW, a 40,000 Ibf engine for that weight and wing is just too low. You must have misread my post as they aren't even close, the difference is well over 30%. The 787-8 has even more cabin area than the 767-400. That 4000nm optimised 787-8 nearly has the exact empty weight and MTOW of the 767-200 non-ER (Both 80T OEW and 1T differnce in MTOW. Yet the 4000nm optimised 787-8 has 45% more cabin area. That is truely a massive difference. For an aircraft to have that much more cabin area witg the same empty weight is just mind blowing to show how much improved efficiency can be gained. and that model sold only 104 frames over its lifetime. The 767-300 non ER was very overweight for its MTOW, cabin area and range. Not at all. It is spot on. The A310-200 has a 219m2 wing and a 144T MTOW weight which is nearly a perfect comparison as my numbers were 218m2 and 145T. The A310-200 engines were only 45,800lb of thrust. My 4000nm 787-8 had a much higher aspect ratio wing with 3m of additional span that reduces thrust requirement. The 767 fuselage is 5.41m high and 5.03m wide. I'm expecting the 797 to be 5.41m wide and 5.03m high. So the same numbers switched around for an extra 15inchs in the cabin width. Boeing can then fit standard 17.5inch seats in 8ab. by stretching an 7W NMA to 764 lengths (61M) or something close to that - a lot easier to do in Carbon with less penalties than Aluminum. Remember the design will most likely have reduced height cross section that is bad for long tubes. A 767-400 with the height of the cross section reduced by 10% would look like a pencil. I was on an A220 flight on Thursday with a gentleman whose son is an engineer on the PW 1500G. According to his son, Boeing has officially reached out to PW for proposals to power the 797 with some iteration of the GTF. The 1500G is gigantic on the A220, I can only imagine how big a GTF would be on the 797. His son's inside info is public info. It was reported in the open that Boeing sent RFPs to all 3 engine manufacturers. I doubt they sepecfied GTF but that is Pratt's current architechture path so I'd imagine it would be used on all commercial engines for the forseeable future. I don't think B767-300ER became successful because of the fact that it got more range than B757, these 2 plane served entirely different market, the range, and the capacity of these 2 are soo different from each other. Also, don't forget, only the smaller B757-200 became successful. B767-300ER got decent range, close to the famous A330-300HGW. And it got big enough capacity which longer flights could be justifiable to operate but small enough to make it easier to filled. There is no other aircraft that offer the "capacity <> range" like B767-300ER. B787-8 and A330-800 got too much range and capacity while A321LR have too little capacity and range for longer medium-haul flights. So the MOM aircraft should have replaced B757-200 and B767-300ER. Now, it's confusing that Boeing didn't try to capture B767-300ER's 583 orders + 212 freighter orders with the larger variants of B797. Especially the fact that it got the similar fuselage cross section. Last edited by ewt340 on Sat Feb 09, 2019 5:10 pm, edited 1 time in total. The success of B767-300ER was tied to the "capacity <> range" of this particular model. like the A330-300HGW, it hit the sweet spots for many airlines. If the larger variants of B797 have a range of 4,500 nmi then, the actual capability would probably be around 3,500 nmi to 4,000 nmi. Which is worse. The larger variants wouldn't be able to connect many European cities to mainland US, especially deep south and west coast US. Central and Eastern Europe could also get restriction because of their distance. West Coast US and South America is unreachable. Sorry - did I miss something? Has Boeing publicly stated what the cross section of MOM/NMA is going to be? The only two parameters I think we know about size is that the engine could be up to 50K Thrust and the larger Variant could seat 270 with conflicting reports on whether or not that is 1 class or 2-class. If it is 2 class that could be 763/4 size, 1 class more like 753/762 size. We will only know for sure when we see the launch specs. Well presumably we are talking about 7-abreast configuration. As all of these discussion would be about speculations. Especially if Boeing would actually launch B797 or not in around 2020. If they went with "next-gen B757" then of course it make sense for the 4,500 nmi because they know the larger variants wouldn't be the top seller. This would be B757 saga all over again. Although, one thing to be considered is that many Analysts pointed out that by 2025, the window for replacing B757-200 is closing in. It might be a case of too little too late. Many airlines would either use B737MAX10 or A321neo/LR. In which Boeing need to look into B767-200/A310-300 and B767-300ER replacement instead of B757-200 to make their MoM successful. So 797 is not a 321 / 322 competitor. It is a B788 / B789 / A338 / A339 competitor and killer. Considering that it will have one generation more efficient engines I suppose that Airbus will soon make their move and replace A330. Cheers. I was thinking about Boeings MQ-25. But yes Northrop Grumman has kept every detail secret on the B-21. There would be many secondary suppliers that could leak specs yet we hear nothing. The question is do you believe them? Similar to what’s going on with the 797. I believe the 797 is primarily a 763 / 764 replacement with much better fuel economy at the expense of range. East coast USA to Europe should be sufficient. Otherwise the growth spiral gets into 787 territory pretty quick. With not much to show for it. Single aisle fuel economy requires small engines. If an A321 carries 200 pax using 35k lbs thrust engines, the 797 needs to be at 50k lbs or less. Nothing today has SFC much better than GTF or LEAP, so a much bigger engine would incur a significant trip fuel penalty. A 270 seat plane optimized for 1000 mile routes will displace a whole lot of A321s and A330s in China. It may kill the A330 since 75% of the A330CEOs deliveries in the last year went to China. It also could take over the US transcontinental market that was the last market where the 767-200 was regularly used. There is a lot of potential. Airlines use new planes to adjust capacity in their network so often they aren’t looking for 1 for 1 swaps. Airline consolidation has led to airlines favoring bigger narrowbodies. This could be the next step. It wouldn't kill B787 or A330neo. The size different and the range capability are pretty different. Especially the fact that Airbus amp up the MTOW on A330neo. But I would believe that Airbus would come up with A350-800neo with smaller wings and new engines in 2025. But again even this plane would be slightly bigger than A330-200, B787-8 or B767-400ER. And instead of competing with B797, Airbus would just created an aircraft to fill the gap between A321neo and A350-900. Time and time again, many of their aircraft doesn't necessarily have 1-1 competitors. I think success of such a subtype would be low if a 50t OEW mass produced 4000nm alternative with GTF/Leap engine choice would be be flying around in the thousands. Maybe not even try. Before the A330NEO was launched I considered a new smaller wing, wing box, landing gear and medium range optimized fuselage would fit in there. But Airbus decided to boost capability instead, probably they felt even a new A300/310 sized, carbon wing would not justify the investments. Apologies Keesje; I initially brushed right past your graphic; but then looked with the attention it deserved and reconsidered that the 330-700 as shown would be closely parallel to say an 8-ab 797. (Don't know what fuse length you were using; IMO the 797-6 and 797-7 fuses might bracket your 330-700). I've surmised b4 that one of the two possible BA strategies is the 797 at 8-ab which not only takes-up the 767-200/-300/-400 space (in terms of passenger count); but also, once a plastic 8-ab fuse is built with nose+empennage sections; then the fact that the initial 797s will have minimal wings and not much thrust is just an early entrant to the BA portfolio. So thereafter the basic 8ab frame is ready to take-on any future AB A330neo replacement. EG there is nothing to stop a later 797-based application with a (moderately) larger wing/engine pairing to fit sweetly under the forthcoming 787neo ... ). (Above all the specifics above is that I regard the 787 as a BA design which has been an (unacknowledged) attempt to neutralise the A330 family. so, equally, a good 9ab will (almost always) defeat a good 8ab! ). (**) (And yes, yes I believe that I have assimilated the teachings of Lightsaber that in fact a 787-8neo will have just too much capability ... but I will leave it unchanged for the sake of simplicity ...). Beluga XL has taken the A330-700 model number. 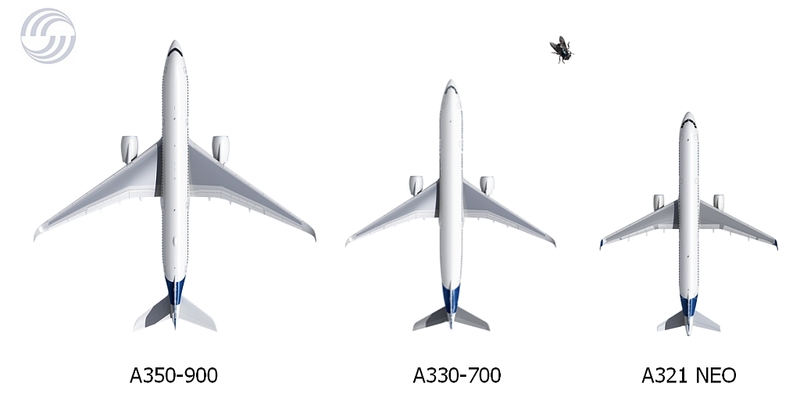 If Airbus decides to compete with the B787 and use the A330 fuselage with new, smaller carbon wings and engines, they should probably call it A360. It should be better for marketing purposes to have a brand new model number. Besides, it has enough new elements and capabilities that justify the new model number. A360 vs B797 looks interesting! May I remind you that this thread is about Boeing 797, so please lets stay on topic. 40% lower trip costs than today’s widebody! I assume that is referring to the 787. 270 seats in a two class cabin with 40% lower trip costs would be a game changer that would likely make the 797 economical for US airlines to buy with the intention of using domestically. That is a huge reduction in the structural weight of the airplane. I assume the this comes from the shorter range requiring smaller wings and a smaller underbelly without the heavy structure to fit in LD3s. The knock on effect is a smaller wingbox, lighter gear, smaller hydraulic pumps, brakes, actuators, etc. I see the 797 as being like 4" wider than the 767, that fits with a 7ab cabin but the 767 has been equipped in a cattle class 8ab. Adding 4" would give an extra 1/2" per seat. enough for a cramped 16" seat arrangement. But that width allows most airlines to use a 7ab at least in premium economy, OK but narrow business class at 6ab and a good domestic first at 5 ab. It already would have the stretch built in, doing the 8ab would add more than 30 seats to the plane with no change except for the seats. It would do double duty depending how it is configured, either doing the current NB routes with 40-50 more seats or doing routes 1,000 nm further than the current NB's with slightly more pax than the A321. The 767 can take an LD3 (just not side by side) and so can an A330. Those planes were built with high cabin floors to do that. What I am reading is that the fuselage will be smaller, not bigger than a 767. The article I quoted earlier is talking about 40% lower trip costs by reducing structure. a 788 that is optimized for short range can have an OEW of 80T? a regular 788 has an OEW of 120T, so how exactly are we gonna lose 40T here? The difference alone is the OEW of an A320! Going for a CFRP fuselage and wing would generally reduce weight by 5-7%. So, a CFRP 797 that has the exact size and dimensions of a non-ER 763 would have an OEW around 80T, roughly speaking (Since 763 had an OEW of 86T). How is it overweight exactly? What part of it exactly? wings? landing gear? Its weight per passenger isn't far off from similar short-ranged widebodies (A300/A310). a 40,000 Ibf engine for a TOW of 145T would result in a fairly low thrust to weight ratio IMO. Last edited by Eyad89 on Sun Feb 10, 2019 7:54 pm, edited 3 times in total. I think the benchmark for a 797 NMA is in production. It has an empty weight of 50t, range of 4000NM and costs typical for an aircraft family build 700/ year. An oval 7 abreast 5000NM capable 797 being more efficient sounds fantastic to me. Reports, like the one quoting Niemann above, is the NMA is a flat oval vs the more common vertical oval. I would guess it may still be a double bubble except now the floor beams are in compression, the lower lobe is minimized, possibly only fitting a LD3-45. Boeing could be doing a narrower than 767 fuse, just able to fit 7ab with 17" seats. No one that hasn't signed a NDA is talking specifications of it. [i]Boeing’s design features a slightly oval-shaped fuselage that saves weight and fuel by devoting more space to passengers and less to freight in the plane’s belly. A smaller version would seat 220 travelers, while a larger model would seat up to 270 people, with trip costs that are about 40 percent lower than today’s wide-body aircraft. The article does not say 270 seat 2 - class - it says up to 270 seats - basically A321 plus another row, smaller is A320 plus another row. Boeing calls the 788 a 242 Seat - 2 class airplane. I highly doubt the NMA in the large version will have more floor area than the 788 to be classed as 270 seat 2 class. The new data point and clue we have is the 40% lower trip costs than today's wide body's. A NMA with floor area greater than 788 but with smaller wing and less cargo space will not have 40% lower trip costs. This (40% lower trip costs) argues for the more likely reality that NMA is A321 plus 30-40 seats - basically an extra wide A320 at 7w with 2 aisles. I believe that would be the only way to get trip costs down that much. Something like an 190"W x 170"H Oval. An 8W 2 class 270 seat plane longer than 788 would never be able to achieve those economies.